Pope Benedict XVI sent a message of congratulations to President Barack Obama Nov. 7, the day after his re-election as president of the United States. Cardinal Timothy Dolan of New York, president of the U.S. Conference of Catholic Bishops, also congratulated Obama Nov. 7. “The Catholic Bishops of the United States offer our prayers that God will give you strength and wisdom to meet the difficult challenges that face America,” the cardinal said. “In particular,” he added, “we pray that you will exercise your office to pursue the common good, especially in care of the most vulnerable among us, including the unborn, the poor, and the immigrant. In the press release containing the text of the letter, the words “our first, most cherished liberty” were in italics. The bishops and the Obama administration have clashed for the past year on a federal Department of Health and Human Services mandate that would require most religious employers to provide contraceptive access to their employees, allowing for few exceptions. With 270 electoral votes needed to secure a presidential win, Obama, a Democrat, had 303 to 206 for his Republican challenger, former Massachusetts Gov. Mitt Romney. Florida’s 29 electoral votes had not been decided the morning after the Nov. 6 election. Four years ago, Obama, previously a U.S. senator from Illinois, received congratulations from a fellow Illinoisan — Cardinal Francis E. George of Chicago, then president of the U.S. bishops — when Obama became the nation’s first African-American president. “I believe we can seize this future together — because we are not as divided as our politics suggest; we’re not as cynical as the pundits believe; we are greater than the sum of our individual ambitions; and we remain more than a collection of red states and blue states. 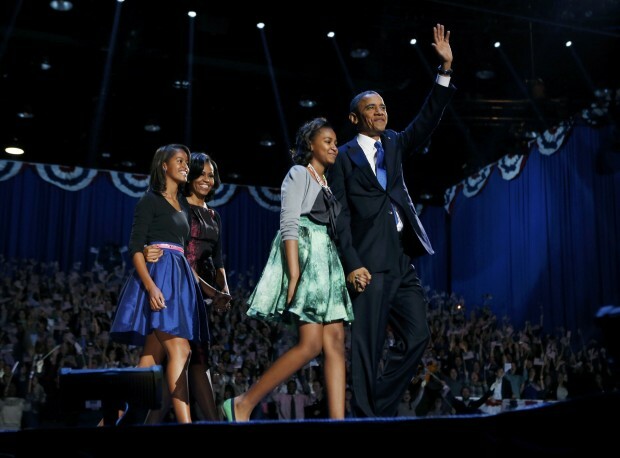 We are, and forever will be, the United States of America,” Obama said at the end of his 20-minute address to supporters at a victory rally in Chicago during the early morning hours of Nov. 7. “And together, with your help, and God’s grace, we will continue our journey forward, and remind the world just why it is that we live in the greatest nation on earth,” he added. Archbishop Jose H. Gomez of Los Angeles also congratulated Obama in a Nov. 7 statement. “Every political office is an expression of public trust and carries the responsibility to work for justice and the common good – not only in our own country but also in the international community. So I pray that God will grant our president the wisdom he needs to carry out his duties, along with the virtues of honesty, courage, prudence and humility that are necessary for true public service,” Archbishop Gomez said. A Catholic Democrats board member, Nicholas Cafardi, was co-chair of the Obama campaign’s Catholic outreach effort. Charmaine Yoest, president and CEO of Americans United for Life Action, took the Obama administration to task for its health care law and what she described as its efforts to expand access to abortion. In a Nov. 7 statement, she said she expected state legislatures and a “pro-life majority” in the House of Representatives to blunt those efforts during Obama’s second term. “While the economy, health care and the deficit were the leading issues that voters specifically cited as most important in this election, the results also signal historic shifts in values and demographics,” said a statement from Robert Jones, founding CEO of the Public Religion Research Institute.